With potted patio plants, container gardening allows you to enjoy the benefits of a broad range of garden plants even in a small space. Container gardens are versatile, attractive and easy to care for, making them excellent additions as patio plants. In this article, we will discuss a dozen of the top picks for creating a container garden that delivers a powerful visual impact. We will also share tips to help you choose the right containers and set up your garden. Read on to learn more. With container gardening, you can enjoy flower gardening, vegetable gardening and even growing dwarf versions of trees and shrubs. Imagine the possibilities for topiary plantings! If you live in a small home with only a balcony, patio or deck space to use for your garden, your entire garden can grow in containers. On a large estate, container gardening provides a way of softening corners, defining space and bringing life into featureless areas. Theme parks make excellent use of potted plants in large containers to create impact. For the best appearance, choose containers all of one type or coordinate using just a couple of different materials. Before you select any containers, take a good look at your home and garden. Choose materials and colors that enhance what you already have. For example, if you have a red brick home, terra-cotta containers will be just right! For greater impact, choose bigger pots. Not only are larger containers visually appealing, but they make care somewhat easier. A larger container will not dry out quickly and can be treated more like a small garden plot. Let your choices in containers reflect your personality. In addition to striving to take into account the style of your home, you can also express yourself through your choice of containers and plants. From perfectly matched, duplicate planters to eclectic mixes of shabby chic your imagination is your only limit in creating an eye-catching and impactful container garden display. The right combination of plants can make all the difference in getting the ultimate in visual effect. Here are some of the top choices for container gardens that pop on the patio! Elephant Ear is a tropical plant boasting large, attractive heart-shaped leaves. This beautiful plant ranges in shades from green and white variegated to plain green or even a dark and impressive purple/black. In the wild, Colocasia grows in swamps. This makes Colocasia a perfect choice as a landscape feature around ponds in warm climates (USDA Zone 8-11). In cooler climes, Elephant Ear makes an excellent container plant to be kept outdoors in mild weather and indoors during cold weather. Alternately, it can do well as a houseplant all year round. If you plan to keep Colocasia as a houseplant, you should be aware that it can grow to be 3-5 feet high. You will need to have plenty of space. It’s best to keep this dweller of the tropics in an area receiving bright, indirect light and stays predictably warm (65-75 degrees F) during the growing season. Placing a humidifier in the room will help keep the plant happy. Although Elephant Ear naturally grows in swamps, you must be sure to provide good drainage. Sitting water stagnates and can cause root rot. Plant Elephant Ear in well-drained, rich soil like this with a layer of pebbles in the bottom of the pot. It is also a good idea to place the pot on a layer of pebbles in a plant saucer to help improve humidity while preventing root rot. During the growing season, fertilize your Elephant Ear bi-weekly with a 20-10-10 plant food diluted by half. When the growing season concludes, stop fertilizing to allow the plant a chance to rest. During the late autumn and winter, reduce watering, lower lighting and provide less stimulation. You may want to move your Colocasia to your garage or your basement for winter. It will be fine kept at a steady 45-55 degrees Fahrenheit throughout the winter. In the early spring, divide the tubers and repot them. You are unlikely to ever see flowering with Elephant Ear, but it does occur in plants thriving outdoors. Colocasia flowers are small, yellow/green cones sheathed in green. Black Magic is dark burgundy and grows to be 3-5 feet high. Black Stem has green leaves, black stems, and deep burgundy veins. Lime Zinger grows quite large at 5-6 feet high. It has chartreuse foliage. Jack’s Giant typically grows to be 5 feet high with deep green leaves. Cranberry Taro grows to be 2-5 feet high and has green foliage and dark stems. Nancy’s Revenge grows to be 2-5 feet high and has dark foliage with cream-colored centers. Chicago Harlequin grows to be 2-5 feet high and has green foliage ranging from light to dark. Illustris is a smaller variety at only 1-3 feet high. It has green leaves with lime green and black markings. This hardy wildflower makes a surprisingly good container plant. You may also see this perky little plant referred to as Calliopsis, Tickseed or Pot of Gold. It also goes by the more scientific names Coreopsis bicolor and Calliopsis tinctoria. Pot of Gold is an excellent choice for a natural, wild yard or a wildflower garden. This hardy little plant produces attractive flowers in shades of red, pink, orange and yellow. The foliage is light and airy and very nice-looking. This wildflower does well in soil that has low fertility, and it presents a striking presence in a large container mixed in with other colorful perennials and annuals. Some good choices include Purple Basil and Nasturtiums. If the patio area where your container garden will live is a shaded area, you can’t do better than the New Guinea impatiens plant! They do equally well in shaded outdoor areas or indoors as houseplants. With regular deadheading, you can expect abundant blooms far into the autumn months. When keeping Impatiens indoors, it’s a good idea to use a hanging basket and keep the plant in a bright, window where it will receive indirect sunlight. Keep your Impatiens warm and protected from direct sunlight and drafts. Water your potted or container garden Impatiens sparingly. You want the surface of the soil to be moist, but you don’t want it soggy. Unlike some types of house and container plants, you do not want the surface of the soil to become dry during the spring and summer months. Indoors, check your Impatiens every day to see if it needs water. Don’t overdo it, though. Soggy soil tends to lead to root rot. Give your Impatiens a water-soluble fertilizer like this once a week to encourage your plants to begin blooming early in the spring and continue throughout the summer and the autumn months. Remember to deadhead very frequently to help prevent your Impatiens from becoming leggy and ungainly. Pretty, Daisy-like, colorful Cosmos flower adds a lighthearted touch to container gardening. These tall, lovely flowers in shades of pink, yellow, orange, red and white do nicely mixed in with a wide variety of plants. They look especially good combined with plants sporting silver foliage. It’s very easy to grow cosmos in containers, and you can harvest lots of beautiful flowers for your dry or fresh flower arrangements. Cosmos sulphureus which is available in red, orange and yellow. Cosmos bipinnatus which produces rose toned and pink blooms. It’s easy to add English ivy to your existing container plantings by taking cuttings and propagating them. This plant does well in a wide variety of settings ranging from full sun exposure to light shade, so it makes an excellent companion plant for many other types of plants. Personally, I would ONLY GROW English Ivy in containers and NEVER plant English Ivy in the landscape! Regarding water, it can tolerate some drought. Ideally, it should be kept lightly moist, and like most plants, it should never be waterlogged. English ivy is fairly pest resistant, but it is subject to fungal diseases if over watered. Fertilize lightly using a diluted (half dose) of your favorite fertilizer. When working with English ivy, you should understand it is far more tolerant of extremes in weather when planted in the ground than when planted in containers. Containers should be placed in relatively protected areas to avoid harsh heat conditions, high winds, and complete freezing. There are several different varieties of this compact, attractive shrub. All present some variation of green and gold variegated foliage. In cold weather, this foliage takes on a pink tinge. Emerald & Gold shrubs can grow to be two or three feet high and attain a width as great as 4 to 6 feet. It’s easy to see that if used in container gardening, the containers must be quite spacious. Nonetheless, the shrubs make a very striking and impactful display in large containers as patio borders, centerpieces for large indoor settings and more. Planting colorful flowers such as primroses, Narcissus, and tulips at the base make a gorgeous presentation, indeed. Do your research! Some varieties of Euonymus fortunei are considered invasive. Skimmia is low maintenance evergreen shrubs producing an attractive array of tiny red buds throughout the winter. These open up to become pinkish white flowers in spring time. It is important to note that Skimmia comes in both male and female varieties. To get good bud and flower production, you need both. Naturally, only the female variety produces buds and flowers; however, you can have several females and only one male to stimulate bud and flower production in the females. Skimmia is a slow-growing shrub. They are also “acid-loving,” so plant them in a well-drained acidic soil and use a fertilizer designed for azaleas and/or rhododendrons. As container plants, they prefer light shade or indirect sunlight. Geraniums and Pelargoniums come in a wide variety of colors, foliage types, and blossom types. You could make a fascinating and varied container garden consisting entirely of these types of plants. The best container for Geraniums or Pelargoniums is a terra cotta pot as good drainage, and soil aeration is of the utmost importance. These plants do not like soggy roots or stems and are very prone to fungal infestation if they are kept too wet. When purchasing Geraniums or Pelargoniums, be sure to check their maximum size and their growth habits. Some types of Geraniums can grow quite large and tall. Trailing pelargoniums do very well in hanging baskets or as the edge planting spilling over the sides of a larger planter. Always suit the size of your pot to the size of your plant, and remember to repot mature plants annually. 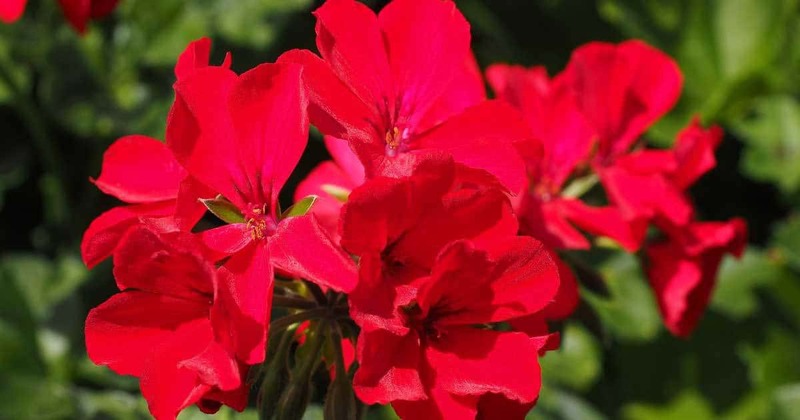 Geraniums and Pelargoniums can be propagated by dividing or by planting cuttings. Annual repotting time is the ideal time to propagate more plants for your home and to share with others. It is also possible to propagate these plants from seed, but it is easier just to take a cutting. Always use a good quality of potting soil for Geraniums. It should be light and airy and nourishing. You don’t need to fertilize often (or at all). When you repot, just be sure to use fresh potting soil and/or finished compost to provide nourishment. You may also wish to provide a monthly dose of liquid fertilizer like this, but if you find you are getting lots of leaves and few blooms, you will want to cut back on that. Place your containers in areas that are somewhat protected and receive at least 6 hours a day of sun. Geraniums and pelargoniums are not cold weather hardy. If you live in an area with hard winter freezes, you must bring them inside. Be sure to deadhead individual Geranium blossoms and remove spent clusters. Also, remove wilted leaves. Don’t drop these onto the soil as they will promote fungal growth. Dispose of them properly by adding them to your compost heap or tossing them in the trash. Some types of clematis are ideally suited for growing in containers. Although often sold as a climbing plant, it does equally well as a trailing plant; therefore, it can make an attractive addition to a container garden. Be sure to give your Clematis vine a large container as this will help protect the roots – especially in areas that tend to freeze in wintertime. Use lightweight, high-quality potting soil like this popular brand to fill your container. At the time of planting, mix in a good quality slow release fertilizer. Provide a trellis or support right from the start if you want your Clematis to climb. If you wait until later, you may damage your plant’s roots. It’s important you understand that Clematis is a thirsty plant. Check on it daily and provide water as needed. If you notice the top couple of inches of soil feel dry, give the pot a good soaking. Provide a good, slow-release, general purpose fertilizer early in the springtime. You may need to fertilize another time or two during the growing season. Be sure to protect your Clematis against the cold by providing a good thick layer of mulch. In very cold areas, place your container in a sheltered outdoor area to prevent damage to your plant. Related Reading: Trellis Plants: What Are 10 Of The Best Flowering Vines For A Trellis? These cheery shade lovers make a very attractive container plant on their own or combined with eye-catchers such as Bleeding Heart or Heuchera. As with most plants, Hostas prefer well-drained soil. It’s wisest to give them a good foundation of an inch of pebbles and a mulch of pebbles on the soil surface. This will ensure both good moisture retention and good drainage. Be sure to water your Hostas regularly and carefully around the base of the plant. Avoid getting the crowns and the leaf canopy wet. By providing light, airy soil and taking care when you water, you can help prevent root rot and fungal disease. These are the main problems you might encounter with hostas. Slugs and snails can also be an issue with Hosta Plants, learn more on how to naturally control slugs and snails here. If you want real impact, you can’t go wrong with Fountain Grass. With its bushy red flowers and long graceful stems, it makes a grand and dramatic statement on its own and is also lovely in combination with plants such as Alliums. Fountain Grass can be grown in beds or pots. It can be kept indoors all year round, and it’s a good idea to have at least one plant that you keep indoors on a regular basis so that you can propagate new plants by division. This is the most effective and efficient way to grow more Fountain Grass. When kept outdoors, you’ll want to cut back your Fountain Grass to a height of about three inches in the autumn after the first frost. Move container plants into a sheltered and unheated area to over-winter. A non-freezing garage or basement is ideal. When over-wintering your Fountain Grass, be sure to water occasionally just enough to keep the soil moist. As always, you do not want to over-water or create soggy soil. To prepare your Fountain Grass to be moved back outside in the springtime, provide bright light approximately six weeks before the last predicted frost of the winter. Begin watering and fertilizing actively at this time. Soon you will see new growth, and this means that you can remove the plant from the pot and divide it to create new plants for your spring garden. Each divided plant should have one or two shoots growing actively. Repot each of these to create all new plants. At this point, you will want to increase light and heat to encourage rapid growth so that you will have nice strong plants for the spring and summer. Fountain Grass is a tropical plant, so you should protect it from all danger of frost. Gradually habituate your new plants to outdoor conditions, but don’t put them outdoors permanently until all danger of frost passes. 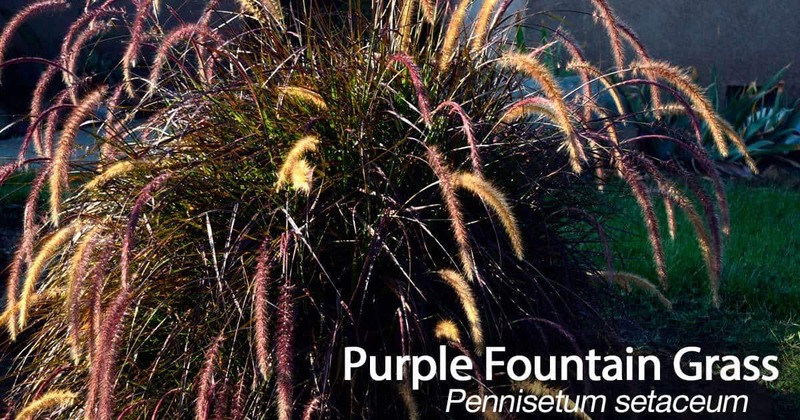 Learn more about fountain grass here. This lovely evergreen shrub produces pale, creamy colored leaves that gradually darken as they mature. When fully colored, they attain a deep and rich mahogany shade. This is an excellent shrub for impact at your entryway as it does need some shelter in the wintertime. This easy-to-grow shrub also makes a lovely focal point on your terrace or balcony. Although Pittosporum does best kept outside, it can be grown indoors in a container in a setting with partial sun. The main thing to remember is to shelter the plant from temperature extremes and high winds. Pittosporum likes soil that is always slightly moist, so you should water well throughout the growing season (spring and summer) and reduce watering from fall through winter. As with most plants, you should avoid over-watering and allow the soil to become slightly dry before re-watering. Pittosporum likes a light, loamy, well-drained and slightly acidic soil. Use a slow release, balanced fertilizer during the growing season. Follow label instructions and avoid excessive fertilization. In the springtime, use aged manure or composted leaves to mulch around the base of the plant and provide it with natural, ongoing nourishment. To keep Pittosporum looking its best, prune it regularly with very sharp pruners or scissors like these. Be sure to cut away any dying, damaged or diseased branches promptly. Don’t prune heavily until the blooming season ends. Then do a comprehensive pruning in preparation for the winter months. Not every container garden requires multiple varieties of plants. Sometimes one simple plant in a nice container is the only requirement. There is something fascinating about a small tree growing in a container. They can be moved around to provide different looks or screen areas as needed. 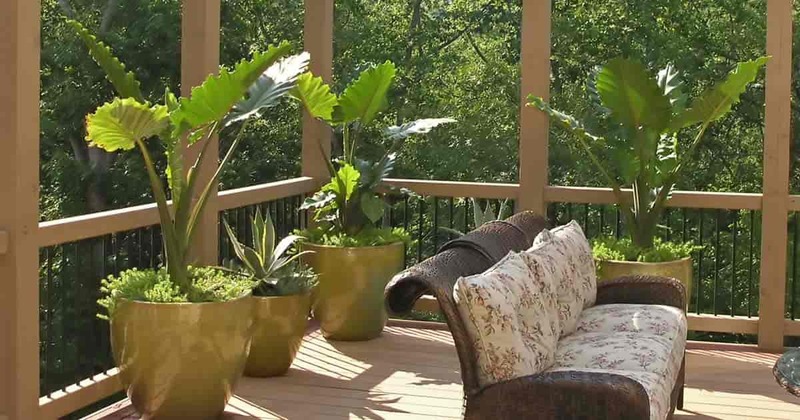 In general, you want these patio plants to add some color to the outdoor space. Flowering shrubs growing as standard trees with a long bloom time make perfect patio additions. We like the look of a small tree in a big pot. The decorative large container helps keep the plant stable when blown around. The potted tropical hibiscus tree is a perfect flowering shrub for use for as a patio plant for color. 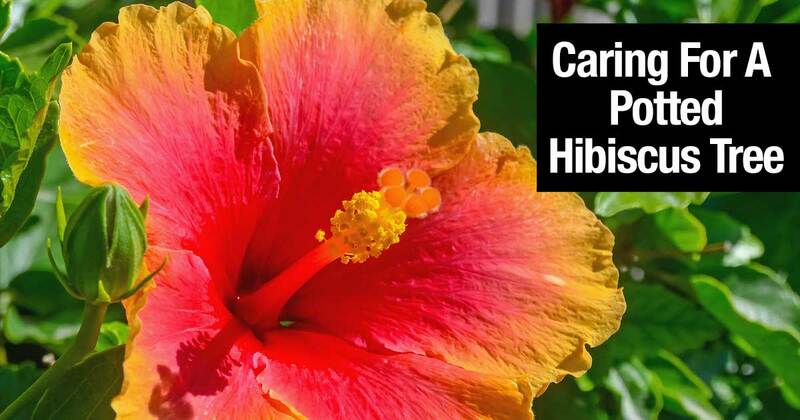 Hibiscus has a long bloom time from spring all the way through summer. Easy to maintain and care for. A bright, sun-loving plant, perfect of any patio with lots of bright light or full sun. Produces flowers in abundance with lots of colors. Lantana care is not difficult. Need only occasional trimming. Plant Lantana as soon as all danger of frost passes. In areas where frost seldom occurs, Lantana can grow and constantly flower all year. Now THAT’S a long bloom time! If color as a patio plant with no need for flowers the Croton plant is tough to beat. It’s only natural that large container gardens have the greatest impact. When you create a large, impressive display, you are sure to generate visual attention in any setting. Here are some smart tips to help you create and maintain container gardens with real flair. 1. When creating a large, combined container display be sure to choose combinations of flowers and plants that thrive in similar conditions. In this way, you can be sure that your choices will always look their best. 2. When selecting a setting, look for spaces that seem to be crying out for color, texture and other visual and tactile points of interest. 3. You can begin with a store-bought container or (if you are handy) build or assemble your own. 4. When selecting plants for your container garden, be sure to read the tags carefully to amass a collection of plants with similar care requirements. 5. For most container gardens, you should water when the surface of the soil feels dry. Water enough that some water escapes from the drain holes in the bottom of the pot. Fill the center of your planter. These should be the taller plants. Spill over the edges of your planter. These should be smaller, cascading sorts. Thrill passersby with color, scent, and texture. 7. Once you have chosen your container and your plants, it’s smart to assemble your new garden where you intend to keep it. In this way, you can avoid having to lug a heavy, full planter to its permanent location. 9. With a very large pot, you should fill the bottom third with drainage material. This could be pebbles, shipping “popcorn”, aluminum cans or other non-biodegradable, non-toxic materials that will take up a bit of excess space, improve drainage and (preferably) help keep debris out of the landfill. Get some ideas here. 10. Keep your soil loose as you work. Fill the container with a loose, loamy potting soil that provides good drainage. Don’t tamp it down at this point as you want to be able to add plants to it. 11. Plan your arrangement. Set the plants and flowers on the surface of the dirt in their pots to get an idea of the look you prefer. Once you determine how to arrange the plants, remove them from their pots (gently without pulling on the stem). Settle them into place and gently tamp down the soil. Add more as needed to bring the level of the soil surface to within 1.5 inches of the top. 12. Start off with good nourishment. If the soil you use does not contain a fertilizer, you are well-advised to add a balanced fertilizer for container mix. Follow package instructions for containers. You may want to play it safe at first by diluting the product by more than 1/2. 13. Finally, add a top dressing of pebbles, moss or mulch to help your plants make the most of the water you provide. A large container garden on a patio is sure to make an impression. You can be certain of making a desirable impression by choosing your containers carefully, coordinating your plants well and planting them skillfully. Follow the tips presented here to make the most positive impact on your container gardens. Sub Irrigation Planters: Is A SIP Right For You and Your Plants?